Toyota Motor (TM) announced Monday that it has begun shipping parts to its dealers to fix 2.3 million recalled cars with "sticky" accelerators and that it will begin sending letters to owners of the affected vehicles later this week. Many dealers will stay open extended hours, some around the clock, to repair the cars, the company said. "Toyota's engineers have developed and rigorously tested a solution that involves reinforcing the pedal assembly in a manner that eliminates the excess friction that has caused the pedals to stick in rare instances," the company said in a written statement.The "simple" fix involves installing a steel reinforcement bar to prevent friction between accelerator parts. The federal government OK'd the fix last week. Toyota said a solution has also been devised for vehicles still in production. Toyota announced last week it would halt production of the eight affected vehicles beginning Feb. 1, until a repair could be devised. The massive recall -- separate from a similar recall of 5.4 million vehicles also involving unintended acceleration but caused by floor mats -- could cost Toyota tens of billions of dollars and possibly millions of customers. 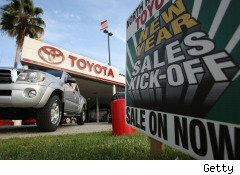 Consumer car-price guide Edmunds.com expects Toyota's U.S. sales in January to fall 12%, giving it a market share of 14.7%, near a four-year low and down 3.2 percentage points from a year earlier, Reuters reports. Competing carmakers Ford Motor (F) and General Motors began offering $1,000 discounts to consumers who trade in their Toyotas last week. In recent years, Toyota has surpassed Ford to become the No. 2 supplier of vehicles to the U.S. auto market. It was on track to eclipse GM, although fallout from the recall is likely to halt Toyota's sales momentum. "Nothing is more important to us than the safety and reliability of the vehicles our customers drive," Jim Lentz, president of the company's U.S. operations, said in a statement. "We deeply regret the concern that our recalls have caused for our customers and we are doing everything we can – as fast as we can – to make things right." Asked on NBC's Today show whether the company's rapid growth in recent years led it to takes its eye off quality, Lentz said Toyota never sought to become the U.S.'s No. 1 carmaker. Rather, it wanted to be known for its quality cars. Toyota's recall involves certain 2009-10 RAV4 models; certain 2009-10 Corolla models; the 2009-10 Matrix; the 2005-10 Avalon; certain 2007-10 Camry models; certain 2010 Highlander models; the 2007-10 Tundra; and the 2008-10 Sequoia. Customers seeking more information can go to www.toyota.com/recall, or call 800 331-4331.